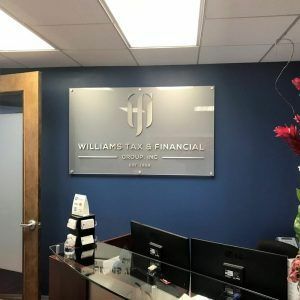 Williams Tax and Financial Group contacted us for a lobby sign they wanted for their office. They had an existing lobby sign but they were looking to replace it because they had recently updated their logo. As you can see from the photo, we made them a very high-end lobby sign that displays their logo onto an acrylic backer panel. The metal tones used in the sign look great with the wall color. Williams Tax and Financial Group, Inc. specializes in bookkeeping and accounting for a wide array of for-profit and non-profit businesses. Their team helps clients looking to begin businesses determine the best entity type for their endeavor, as well as assist in developing successful plans for business operation. They also provide existing businesses with bookkeeping services such as accounts receivables, accounts payable along with monthly financial reporting. Williams Tax Service was founded in 1958 by the current CEO’s father. They started out as a tax service that provided knowledge in tax advice and ensuring that clients comply with all federal, state, and local tax laws. After two decades of providing financial services to high net worth individuals such as athletes and entertainers, they changed their firm name to Williams Tax and Financial Group in 2003. Today, they continue to offer a full range of financial services which include tax planning and preparation, business management, and account to clients worldwide. Professional businesses such as this can benefit greatly from a lobby or reception area sign because they consistently have clients coming into the office. The quality of the sign helps reflect the quality of their services and assures clients old and new that they’re getting the best tax and financial knowledge possible. If you’re looking for a custom lobby sign for your business or any other type of sign, we can help. We specialize in high-end signage that helps your business look great!